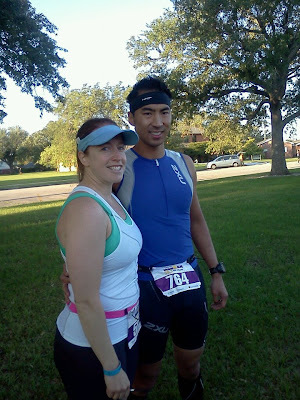 The 2012 season kicked off today with the New Orleans 70.3 Half Ironman which was actually a 67.1 since the crappy weather cancelled the swim and changed the format to a 2 mile run/52 mile bike/13.1 mile run. What was I most excited about? Having my wife finishing this race with me along with our parents, my sister, and an amazing group of family and friends cheering us on (virtually). On that note, I came across this incredible reminder that weekends like this can never be taken for granted. Thanks again for everyone's well wishes and support. Y'all good people! (in my best New Orleans accent). The last time I did this was for the Ironman Arizona and it received a pretty good response so I'll do it again with the three Ironman events I'm racing in this year, starting with New Orleans 70.3. The contest is simple, leave a comment with what you think will be my total finishing time for the race. For the 70.3, that would be a 1.2 mile swim, 56 mile bike, then 13.1 mile run and two transitions. UPDATE: Due to weather conditions, the swim has been cancelled. 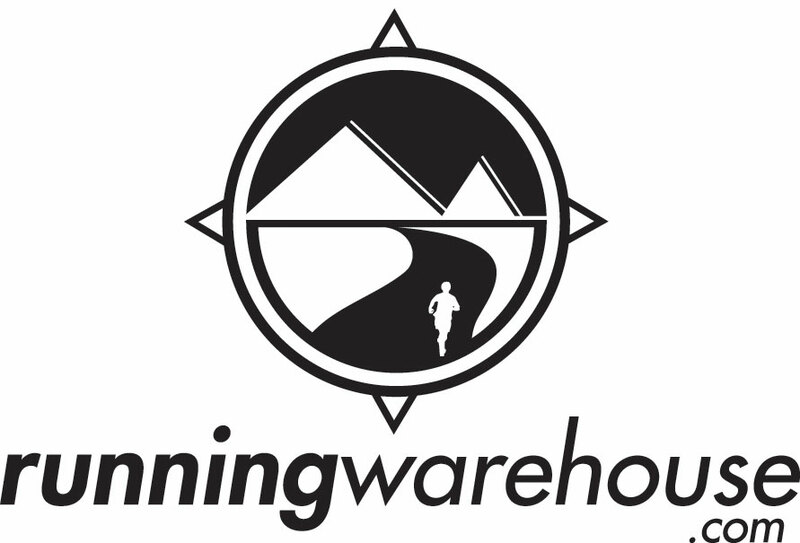 The race is now a 2 mile run, 52 mile bike, and 13.1 mile run. The closest time (can be over or under) wins! Deadline to submit a guess is 5am EST on Sunday, April 22. Last week was a weird week for training. There were no "life events" that interrupted with training but volume was under what I should be hitting. I think I was mentally shot last week because I didn't build in a recovery week after the FTP test. A large part of long term training plans is to build in these breaks to keep everything fresh and I was negligent and it showed. It is discouraging to look back on a week knowing you left some effort "on the table" but the real test of character is how you react to it -- either continuing to slump or rebounding even stronger. 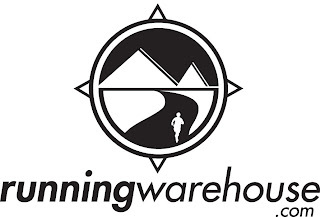 Unfortunately, this is not the week to rebound stronger since it is a race week which means lower volume with workouts primarily being short, high intensity intervals or race speed specific work. 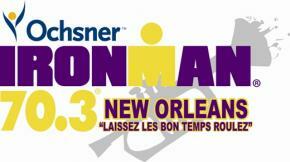 I guess the ultimate indicator will be how things go at New Orleans 70.3 this coming Sunday. Adding in 100 jump ropes between my sets when I do my strength workouts. I'm getting some extra cardio/plyometric work as a bonus which is about 700 - 1000 jumps per workout. I may change those to double unders at some point since the 100 feels pretty easy each time. Rode my new Cervelo S5 for the first time! This will be my chariot for riding up The Wall during the Manayunk Bike Race Amateur Open. Experimented with taking Baking Soda (Sodium Bicarbonate) before my workout on Saturday. I've been reading that taking baking soda before speed efforts could increase performance by buffering lactic acid. Unfortunately, I didn't calculate the dose right and took WAY too much which caused a lot of GI distress and inability to complete my workouts on Saturday. Proper dosing is .1 grams per KG of bodyweight 90 min and 30 min before a workout. This works out to 1.5 tsp per dose, 3 tsp total. I took 5.5 tsp 30 minutes before which def F'd me. Lesson learned! Injury-wise, I've probably been in better shape. The plantar fasciitis is starting to act up which is bizarre since I ran LESS last week. The calves are also sore after some runs but I'm hoping that it doesn't lead to a strain. Annoying things, but nothing that will keep me from racing this coming Sunday or potentially affect how I race. Tuesday Tunes - Back to the 80's! Sometimes you just want to throwback to a time when people were working out in cotton attire in a nice pair of Adidas Samba's with some knee high leggings. If you are trying to figure out the perfect soundtrack for this workout (or 80's themed party), the one hour mix below will hit the spot. Recovery Day is no longer a complete "Day-Off" It now involves a very easy 4-mile run to stretch out the legs. I'm also making it a point to do a complete foam roll/stick of all the major muscles, sleep a little more, absolutely eating clean, and wearing compression socks all day on this day. I'm also doing the 4-mile run "fasted" to start getting my body used to burning fat at an aerobic effort...this is critical for getting through endurance races. The week started out great with a re-test of my FTP. The FTP tests always drain me (which is the point) but it was encouraging AWESOME to see my FTP rise by 26 watts from 276 to 302 which was a 9% increase. This was definitely a high point for the week. The other small win was actually running again and getting in about 27 miles. Still some lingering pain in the quads and the calves are sore from the 10-miler on Sunday but its good just to be running consistently again. I was also surprised to fit in 5 runs in a week and not stress out about it. I wasn't sure I could fit five in but it worked out well with how I scheduled them. On the flip side, my swims were just not up to par this week. I had two swims, one for 2000 yds and one for 1250 yds. Neither swim really contributed to overall fitness as they were basically swims just to swim. I had planned workouts but mentally couldn't finish them. I think a large part of it was being psyched out about how slow my swim times are comparative to others and knowing that is holding me back at the races and keeping me from placing within the Age Groups. I think I'm over it and am starting a specific 12 week swim program on Wednesday so hopefully I fix some of the issues and get some more confidence with my swimming abilities. The crappy swim on Wed also let me to skipping the bike on Thurs and just doing a strength workout to get mentally back into the game. Injury-wise, the left quad is still troublesome and the calves are still sore from running again after nothing for a week but nothing right now which would be a cause for concern for the NO 70.3 in under two weeks. This week will be a full week of normal training and then next week will be a slight taper before the first big race of the year. It would happen like clock-work annually around the late-March/early-April time frame. Spring sweeps in with improving weather and better conditions to be outside but along with it, allergy season. In the past, I have had horrible reactions this time of year. I usually am sick for a couple of weeks with constant sinus congestion. On occasion, it may cause me to get pink eye. My junior year in college, I was so sick that I had to spend Easter weekend alone in my dorm room because of how hard allergies hit me. Needless to say, the effects of allergy season were not real conducive to getting quality workouts in for late-Spring races like the Broadstreet Run. Over the years, I've tried a number of things to help me get past this time of year in one piece and I think I have nailed down a few key things that have prevented me from getting sick the last few years and basically get through allergy season without getting sick/feeling crappy. The nice thing is that these tips are easy to implement and more cost effective than visits to the doctor, potential shots, and loading up on Over the Counter drugs. I hope these tips work for you and keep you on track with your training. 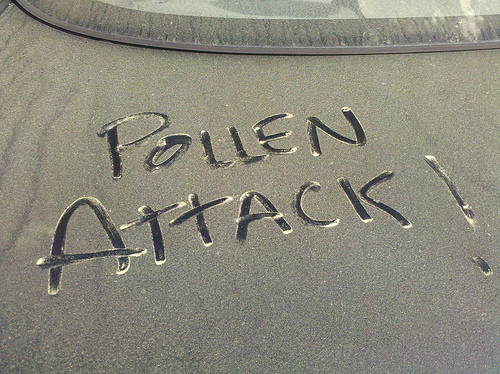 Let me know if you have any secret tips for allergy season as well in the Comments. This past week might have well been Aqua-Velo week since all the key workouts were either swimming or biking. My lower left, outside quad was still bothering me on Monday so I opted to just take the week off from running and let it heal itself, in addition to TP rolling in the morning and in the evening. Despite not being able to run, the swim and bike workouts were solid. One of the changes I've made to my training schedule is shifting the swims to Wednesday and Fridays after work so I have time to do at least 3000 yards. I've actually hit 3200 and 3400 yds on the swims the past week because mentally, I tell myself it is only 200 more yards to hit 3200 which is roughly a 2-mile swim. If I can consistently hit 4-miles swim every week that would be phenomenal but we'll see. From a bike perspective, I had 4 great bike rides. I cut the Saturday ride short by 30 minutes which I feel a little annoyed about since it was the first TrainerRoad workout where I couldn't finish it purely because of difficulty and not running out of time. I rebounded well with a solid 2-hour trainer ride on Sunday which I'm pretty happy about because I get impatient with anything over 90 minutes riding inside. I've also been very consistent with the strength workouts, hitting the weights twice a week and doing core three times a week. My daily morning routine also now includes doing the Myotatic Crunches every day and I am up to doing 12 of them with a 5-lb pound weight. I'm starting to see results from these crunches which is great news for beach season. There was travel in the middle of the week to Boston but I made sure I did my bike workout before leaving for Boston, getting a workout in before the customer meeting on Wednesday, and then stopping at LA Fitness on my drive home to get my swim in. I am commonly asked how I fit in all the workouts with my work schedule. I will say a lot of it is planning ahead for them and being stubborn about getting them done no matter how I feel. Injury-wise, the tightness/strain on my left quad has gotten better and I'll probably try to run a few times this week to see how it feels. The other major injury from last year, plantar fasciitis, has been kept at bay but there are still mornings when I wake up and the first few steps are a bit painful. The calf strain I had a couple of weeks ago seems to have healed itself. 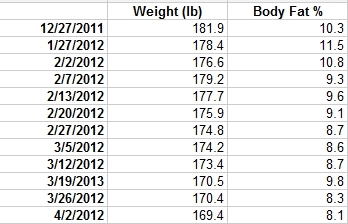 From a body composition perspective, I am down another pound from last week, now at 169.4 lbs. Body Fat % is also down from 8.3% to 8.1%. I wish I took measurements of my body with measuring tape because I've def seen improvement with things like my pants fitting a bit looser around the waist. Dropping the "garbage" weight was one huge point of focus for me the past few months to shave time off my min/mile running pace (rule of thumb is 2 secs per pound) and also to optimize my Watts/Kilogram power number on the bike. It is amazing to look back at the progression over the past two months. 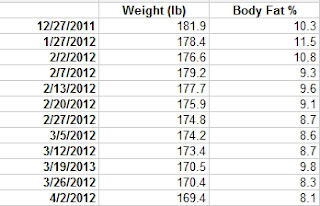 One thing I'll mention is that I dropped all this weight despite being on creatine supplementation, not counting calories/portions, and making sure I take in a large amounts of high glycemic carbs almost daily. I know these three things seem very counter-intuitive with conventional knowledge about weight loss so I'll explain in a later post.